The years between 1968 and 1980 represented a loss of innocence for the anglophone Caribbean. The four most populous territories, Jamaica, Trinidad and Tobago, Guyana and Barbados had gained their independence and the others were close by ’68. A redefinition of self was underway politically, with socialist rhetoric coming to the fore; economically, with demands for a say in issues like pricing of the mainly primary products and a move towards self sufficiency; and socially with a new self identification. No one characterizes this period of metamorphosis better than Ras Ikael Tafari, PhD, who passed on this week in Trinidad where he had gone to deliver a speech at an African Liberation Day event, Wednesday, May 28, having given another speech Sunday in Bridgetown, Barbados. Ikael, born Michael Hutchinson, into a prominent Barbadian family, on graduating from the island’s top boys’ secondary school, Harrison College, headed off to the Mona, Jamaica campus of the University of the West Indies. The tall, fair, blond, blue-eyed boy from the Barbadian milky honey family must have been expected to get a degree and join his dad in the family business Ecaf Products producing coffee, spices, essences, pepper sauce and mauby syrup. But these were the heady days of Walter Rodney grounding with his brothers in the poor communities that adjoined the campus, student uprising and lecturers wearing dashikis, khaki pants and sandals instead of cotton shirts, terelyne pants and closed toe shoes. When I met Ikael at Mona in 1978, he had been teaching Political Sociology for since graduating and had not gone back to Barbados to the family business. He was an almost gaunt figure as he sauntered, his six foot plus frame draped in garb that shouted his Rastafari identity: khaki suit an’ t’ing, ites, gold and green prominent in the mix and a huge cap with a button of Emperor Haile Selassie I perched atop his head covering most of his dreadlocks. Ikael was at Mona among a firmament of rising Caribbean political stars and the revolutionary contest was on between Caribbean socialism and Rastafari for the minds of the progressives. The Mraxist, Bernard Coard, a member of political science lecturer Dr Trevor Munroe’s Worker’s Liberation League (precursor of the Workers’ Party of Jamaica), taught at Mona in the mid 70s, before returning to Grenada in 1976 ahead of the 1979 left wing coup on the island. St Vincent and the Grenadines prime minister, Ralph Gonsalves, was president of the Guild of Undergraduates, that led the student protests at the banning of Rodney by the Jamaica Labour Party government, and went on to complete his doctorate in political science at Mona. Dr. Peter Phillips, Jamaica’s national security minister, in the most recent People’s National Party administration, ventured into the realm of Rastafari as an executive member of the 12 Tribes of Israel before returning to academia at Mona and becoming involved with the Workers’ Party. And Owen Arthur, whose Barbados Labour Party administration established the Pan African Commission, of which Ikael was the inaugural deputy director in 1997 before becoming director in 2004, was at Mona gaining his economics degrees in the early 70s. Ikael, like most of the others mentioned were solidly middle class individuals who had in their way committed what the socialists call class suicide to commit to their political or religious calling. He was from a family known as much for its position as its community involvement being related to Barbados’ first native governor general, Sir Winston Scott for example and Penelope Hynam, who has committed most of her career to conservation of the Barbadian and Caribbean heritage and environment through the Caribbean Conservation Association. For the era when he embraced the livity of Rastafari, with his outward colour-afforded privilege and social class, he was radical and revolutionary but even in this new environment, Ikael was anything but conventional, for while embracing much of the natal Nyabinghi doctrine of hair and diet he held very socialist political views that could border on heretical in some conservative binghi circles that would “fire bu’n” the UWI as an institution and what it is perceived to stand for. With Michael Manley’s left wing PNP administration that came to power in 1972, Ikael, while maintaining his Rasta creds conducted assignments with the Social Development Commission, a not unusual position for the political sociology he taught but because many Rastafari saw any level of political engagement as a sure sign of collusion with the crazy Babylonian bald heads. And while it was the 12 Tribes that was attracting the whites and browns to their congregation, it was among the Nyabinghi tradition that he identified. It was not only in Jamaica that the political and religious revolution was taking root. There were violent uprisings in Anguilla and Dominica before the 1979 Grenada putsch. When the overthrow of Eric Gairy came, dreadlocked Rastas were among the rebel forces – a shocker to many in and outside the faith. The rise of reggae and its accompanying counter culture gave rise to a number of visible Rastafari: Black Stalin the Trinidad and Tobago calypsonian put to song in 1979 his own observation of the spread of the movement in “The Caribbean man”. There was Bro Valentino, Ras Shorty-I and others in the calypso sphere. Poet Robert Lee in St Lucia was pushing Rasta in the publication Toutwell before he went to the Roman catholic priesthood and then dropped out of that as well. Ras Frank-I a popular Leeward island broadcaster was prominent and there were scores more. They were vocal in support of the liberation struggles in Southern Africa and Cuba was busily backing Manley, Maurice Bishop in Grenada while blowing away “reactionary” and mercinary forces in Angola and Mozambique. So that when the right wing JLP under Edward Seaga came to power in Jamaica in 1980, it was a ripe time for the non-renewal of Ikael’s work permit. It was back in Barbados that Ikael continued part-time teaching at the Cave Hill campus before he began working on an MPhil. He gave me the tome of a thesis to read and explained that the work had become so huge the supervisor had suggested he pursue the project as a doctoral dissertation. Although the monograph “Rastafari in Transition: The Politics of Cultural Confrontation in Africa and the Caribbean”, has been in print several years, I still can’t admit to have read much of it. Ikael stirred controversy in proffering non-biblical theses in support of his Rasta theology and of course drew criticism from religious thinkers like Jamaica’s Rev Clinton Chisholm, one of the few Caribbean Christians to challenge Rastafari in an academically rigourous way. While many in the region continue to see Barbados as ‘Binshire’, Little England, it was the first Caribbean country to officially accept its Afro heritage as shown in the establishment of the Pan African Commission to deepen relations between Africa and its diaspora. “I consider it an honour at this time to be an invited to take up a leading role in the Commission and also an honour for the Rastafarian community of which I am a part,” Tafari said when he was appointed to the directorship. “I have waited a long time in my life for the opportunity to make this contribution and I don’t see any danger of me being muzzled, because I understand that politics is the art of the possible. “I can’t be conservative. The Commission itself can’t be conservative. Just the very exisence of it, is a radical break with our history,” he said. Still there were those critics who were dissatisfied that someone with his complexion had been given the job. But he had never perceived of himself as other than Black African. 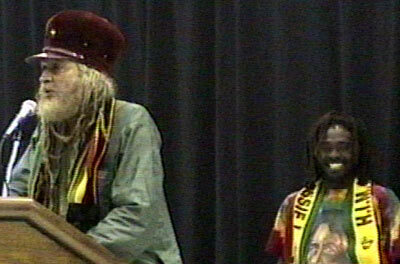 He was continuously catalyzing regional and international Rasta and African political, economic and social issues and was passionate about the welfare of the founders and elders of the movement as was brought out when a Barbados group hosted an International Rastafari Conference Trade Fair and Expo in 1998. I am sure he still is committed. Walk good mi brethren.